Map showing location of JLUS area. The Southern New Mexico – El Paso region is unique among defense communities in the U.S. due to its physical size, distinctive natural, recreational and cultural resources, and emerging growth opportunities, such as renewable energy and its importance as a military training and testing environment. 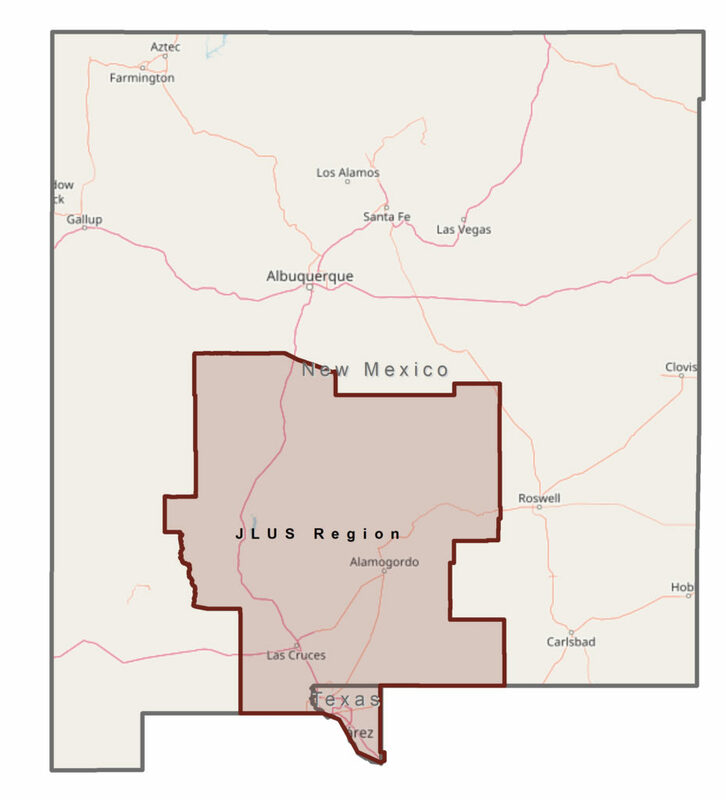 The Southern New Mexico – El Paso, Joint Land Use Study (JLUS) is a cooperative process among the public, city, county, state, federal governments agencies, and the military installations of Fort Bliss, Holloman Air Force Base and White Sands Missile Range. The study looked at issues such as land use, economic development, infrastructure, environmental sustainability, and the operational demands and mission changes of both military and civilian entities within the six counties of Doña Ana, Lincoln, Otero, Sierra, and Socorro in New Mexico and El Paso County in Texas. The intent of the study is to highlight common interests between the Department of Defense and civilian investments and missions as they affect economic growth, more efficient infrastructure, healthier environments, and an improved quality of life. Participation and feedback from the region’s residents and communities was critical to the success of the JLUS. The JLUS Final Report drew from the input of the public, study partners, and other participating interests to develop recommendations that protect the public health and safety of both the civilian and military communities, preserve and enhance the military missions of the three installations, promote compatible growth and land uses, and improve regional cooperation. The recommendations are meant to guide future decisions and policy actions by public agencies, military installations, and other partners. An important ingredient of a successful JLUS is building capacity of the partners, but also from the community. If the JLUS is to have positive results, the participating jurisdictions and military installations must agree to make a good faith pledge to implement the recommended actions and strategies necessary to achieve compatibility between civilian and military missions. The Southern New Mexico – El Paso, Joint Land Use Study (JLUS) completed on February 28, 2015 encompasses six counties, two states, and the three military installations: Fort Bliss (FTB), White Sands Missile Range (WSMR), and Holloman Air Force Base (HAFB). Doña Ana, Sierra, Lincoln, Otero, and Socorro Counties, the Cities of Las Cruces and Alamogordo in New Mexico, and the City and County of El Paso in Texas surround the installations and encompasses approximately 27,000 square miles. It is among the largest JLUS areas studied to date. Within its geographic span, the region’s natural, cultural, recreational, renewable energy resources, weather, terrain, growth opportunities, and diversity of military training and testing missions create one of the most distinctive and valuable defense communities in the United States. JLUS Implementation is strictly advisory, simply offering strategies and tools available to each study partner entity. All partners, including the military installations, cities, counties, and state and federal agencies have the discretion to adopt recommended strategies that are appropriate for each separate entity. The JLUS emphasizes coordination and communication as a way to strengthen the relationship among the study area partners and to build a framework for successful implementation and monitoring of progress toward shared goals. No ordinance or statute or mandate will be imposed upon anyone. As a result of those goals, workgroups were identified as part of the Implementation Committee to work through the strategies identified during the Joint Land Use Study. Building institutional capacity to manage airspace jointly and establish a notification process for vertical structures. Increasing information and communication about regional noise impacts, and conducting community/agency outreach. Improving collaboration on energy development planning, mapping energy development opportunities and promoting water planning. Encouraging participation in local government plans, promoting compatibility of state trust lands and supporting conservation partnerships.